Home Success Tips Success Tips: What are the best ways to deal with failure? Why are we all so afraid of failure when we have all tasted it in every facet of life? Follow these success tips to face your fright! I HAVEN’T FAILED. I HAVE JUST FOUND 10,000 WAYS THAT WON’T WORK. That’s the thing about failure. It is a situation and situations change all the time! We face failures in life at each stage and of each kind. If it is such a usual thing, why are we so afraid of it? Let’s look at these success tips which will help all of us approach failure with a new perspective. We are such an instant gratification society. We want things and we want them now. Why should we have to wait when we have on-demand everything? From fast food to high-speed Internet access, along with a growing impatience for just about everything, it’s no wonder failure hurts so much. We are so used to getting what we want and getting it quickly that we don’t realize just how much work and effort it’s going to take to achieve something notable. It takes time. But during that time, as we make the journey towards our goal, we build character and reach new understandings, possibly even discover a deeper meaning to our lives. The naysayers will be out in full force. But don’t listen to them. Ignore their calls and their cries to celebrate your demise. And just put your head down and keep plugging away. Just realize that people will always be there to celebrate your demise, but the true friends will be there to celebrate your successes and help inspire and push you to achieve your goals. While failure might be difficult, it’s also a time when we tend to search for clues, because success leaves clues. Seek and you shall find. Search for someone whose success you’re trying to emulate in whatever field it is you’re trying to achieve your goal in. Then, look for clues. What did they do? How long did it take? How many times did they fail? People simply don’t realize that some of the most successful people have failed the most times. But the most significant distinction is that those people didn’t give up. That’s the biggest difference between those that succeed and those that don’t– their unrelenting spirit of persistence. Sometimes, it isn’t even the failure itself that scares people; it’s the fear of failing that holds them back from doing something. But, overcoming failure is also a chance to face down your fears. It’s a chance to overcome that innate desire to run far away and cower in some corner. The pain-pleasure paradigm is very real. We will always do more to avoid pain than we will to gain pleasure. But, when we can leverage that knowledge and overcome our fears to achieve our goals, a transformational shift occurs. There’s an incredible feeling that goes along with it, and it’s an invaluable experience to pave the way for a lifetime of achieving goals. When we fail, it should be a chance to learn from our mistakes. When we can use that knowledge, put it on our belts, and push forward, some tremendous things can happen. There are a number of ways we can actually learn from the failure, but in order to do so, we need to look at the failure objectively, like an outsider looking in. Ask yourself why you failed. Where did you go wrong? What could you have done differently? Was it your plan? Was it because you failed to see something you should have seen? Did a bad habit do you in? Really look at it objectively and learn from it. Use that knowledge to improve yourself and try again. As long as you don’t give up, you can always overcome failure to achieve your goals. 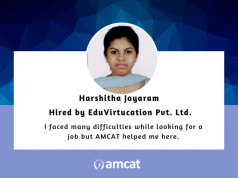 For more fresher jobs, IT jobs updates, success tips and employability news, stay tuned to the AMCAT blog.